Colesville Road was closed in both directions Tuesday morning between Sligo Creek Parkway and Indian Spring Drive after an accident involving a Montgomery County police officer and a Toyota sedan. Authorities say the closure will affect the morning commute. As of 9:30 a.m., the road was reopened to traffic. The officer was responding to a call when the crash happened. Investigators have not said who is at fault or if the emergency lights were in use. The impact forced the police cruiser into the median of Colesville Road, and the sedan wound up in a driveway. Although crews had to cut the top of the Toyota to extract two from the car, the passengers were not seriously injured. Those passengers and the officer were all transported to the hospital for treatment. Megan McGrath's live report on a crash between a Montgomery County police cruiser and a Toyota in Silver Spring Tuesday morning. 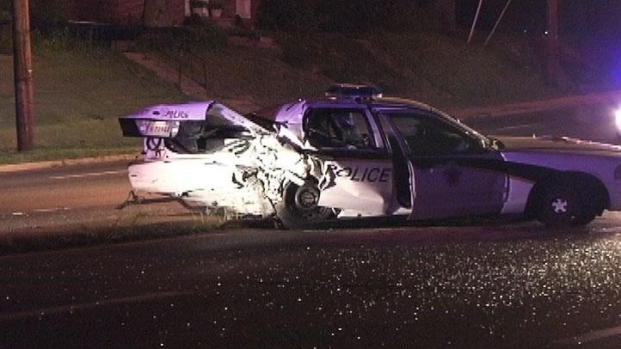 Authorities identified the officer and the other motorists involved in the crash on Tuesday. Brendan Hopkins, an officer with Montgomery County Police for 1 year, was driving a 2004 Ford Crown Victoria in the crash. The two other victims were Yvonne Wilson, age 62, and Lorenzo Wilson, age 66.